He was born in 1733 in the Finnish town of Turku, at that time the major Finnish city and administrative center under the Kingdom of Sweden. He was the son of an amateur naturalist and professor of Medicine at the Academy of Åbo, Herman Spöring Sr. (1701–1747). Spöring Jr. attended the Academy as a youth, studying medicine under his father. Sometime around 1755, at the age of 22 he went to London, where he worked at a watchmakers. During this time he became acquainted with the Swedish naturalist Daniel Solander, who employed him as a personal clerk for a time. In 1768 Spöring was enlisted as a clerk, assistant naturalist and personal secretary in the entourage of Joseph Banks, a wealthy young botanist who was preparing for an expedition sponsored by the Royal Society to the Pacific Ocean. This expedition had as one of its principal goals the observation of the transit of Venus; however it was also intended to make scientific studies of the flora and fauna of any new lands encountered. Indeed, the confidential purpose of the voyage (in particular, from the point of view of the British Admiralty) was to seek out the hypothetical "unknown southern continent", orTerra Australis (Incognita). The other noted naturalist on the voyage was Daniel Solander, Spöring's former employer who had recommended Spöring for the post when he himself signed up. Solander was a former student and protégé of the noted Swedish botanist and founder of modern taxonomy, Carl Linnaeus. Spöring was also a skilled instrument maker, and in addition to his cataloging duties was assigned the maintenance and upkeep of the ship's scientific equipment during the voyage. The expedition left England in 1768, aboard HM Bark Endeavour under the command of R.N. 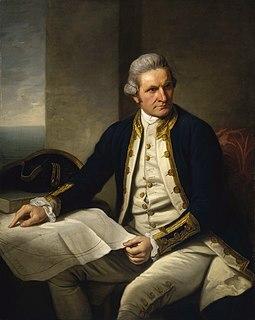 Lt. James Cook, bound for the Society Islands (present-day Tahiti). They arrived there in 1769, where the observations of Venus were taken during the transit on June 3. Spöring had to repair the astronomical quadrant after it had become damaged when it was taken by the local Polynesian inhabitants. Leaving the Society Islands, the expedition sailed southwards, reaching New Zealand, where Spöring and the other naturalists spent the ensuing months gathering and documenting specimens of native plant and animal life. At a bay now known as Tolaga Bay (not far from the modern township of Gisborne), Cook bestowed the name Spöring Island to a landmark, after the botanist. The island is today known by its original Māori name, Pourewa. The expedition continued westwards, and in 1770 the Endeavour encountered the southeastern coastline of the Australian continent, and became the first European vessel to have navigated the eastern side of the continent. The expedition made first landfall at a site Cook named Botany Bay, very near the site at which 18 years later the colony of Sydney would be established. Banks, Solander and Spöring collected further unique specimens from this site. This collection would be greatly augmented later when the Endeavour was laid up for several weeks for repairs, after having run aground on a section of the Great Barrier Reef much further to the north. The naturalists availed themselves of the opportunity whilst repairs were being made to continue their compilation of new species. Once repairs were made the expedition continued northwards to the East Indies port of Batavia (Jakarta). Until this point in the voyage, no crewmember or passenger had been lost to disease; however, the unhealthy conditions of the port and their new provisions would soon result in quite a few deaths, including that of Spöring himself. In 1771 on the return leg, Spöring died of dysentery complications related to food poisoning. He was buried at sea on January 24, 1771. He has a commemorative statue dedicated to him in Sydney, Australia. In 1990, a rock taken from Pourewa (Spöring) Island was transported to Spöring's birthplace of Åbo, Finland, to be placed in a monument set up to commemorate his achievements and ties with New Zealand, as the first Finn to have landed there. Amongst his achievements are the discovery and illustration of a number of hitherto-unknown Australian species. His colleagues and successors who studied his materials have recognised the accuracy and form of his drawings and annotations. His efforts, along with those of others on the voyage provided critical new materials for study, which allowed further advances in the historical development of the theory of evolution to be made. ^ "Turku and the Spöring Memorial"
Related to Herman Spöring Jr.
Herman Diedrich Spöring Sr. (1701–1747) was a professor of Medicine at the Academy of Turku in Turku, Finland, and an amateur naturalist. Alyxia spicata, commonly known as chain fruit, is a sprawling shrub or vine in the family Apocynaceae. It is native to New Guinea and the Australian tropics. Rockingham Bay is a bay in Far North Queensland, Australia.